ADSORPTION STUDY OF CR(III), NI(II) AND ZN(II) IONS ONTO THE MULTI-WALLEDCARBON NANOTUBES - тема научной статьи по химии из журнала "Химическая физика"
Nowadays our environment has faced soil and air pollution that they are life-threatening for us. One of the effective ways for cleaning up contaminants is adsorption by nano structure particles. Particularly carbon nanotubes with high adsorption capacity are under observation. In this investigation, multi-walled carbon nanotubes (MWCNT) were used for removal of Cr(III), Ni(II) and Zn(II) ions from aqueous solution. The contributions of adsorption parameters, such as the contact time, pH, MWCNT dosage and initial metal ion concentration were studied and optimized. Subsequently, Langmuir, Freudlich and Temkin adsorption isotherms were used to explain the experimental data. Freudlich model is more appropriate to describe the adsorption characteristics of chrome and zinc ions while, Temkin model shows the best agreement for nickel ions. Keywords: adsorption, heavy metal ions, multi-walled carbon nanotubes, adsorption isotherms. Heavy metals like Pb(II), Cu(II), Cr(III), Cd(II), Zn(II) and Ni(II) are the most metal ions contaminant in wastewater. These ions are toxic for all creatures even in low concentration . One of the most important problems in our world is the pollution of environment by toxic and dangerous heavy metal ions [2—4]. Many techniques and methods to remove heavy metal ions from water and soil have been developed, such as filtration, coagulation, adsorption, reverse osmosis, oxidation, ion exchange and chemical precipitation . Majority of these methods are time consuming with high price and low performance. So, few of these techniques are common but coagulation and precipitation are used in most of factories. In the recent decades, adsorption method is widely used because it is cost-effective and simple. In this method, numerous materials can be used as adsorbents to remove heavy metal ions from water, such as carbon active , activated bentonite , tea leaves , rice husk , modified nano alumina  and carbon nano materials , and so on. Nano materials have a large specific surface area, which leads to better metal ions adsorption . Since metal nanoparticles adsorbents are environmentally friendly, they have been used as effective materials for removing organic and inorganic pollutants recently . Among metal nanoparticles, iron nanoparticles have observed because of numerous characteristic namely abundance and quick reaction beside high yield in removing of metal ions . Effective factors in adsorption processes are acidity, temperature, particle size, initial concentration of metal ions, structural characteristic of adsorbent, contact time and presence of other ions . Li and others have studied the adsorption ofPb(II), Cu(II) and Cd(II) onto the MWCNT . They reported the maximum adsorption capacity of 97.08 mg for Pb(II), 24.49 mg for Cu(II) and 10.86 mg for Cd(II) per 1 gram of adsorbent in pH = 5 and 10 mg • L-1 metal ion concentration. Also they found that metal ion adsorption capacity by MWCNT is 3 or 4 times higher than usual adsorbent like carbon active. Deliyanni and others synthesized new adsorbent for As(V) containing iron chloride hydroxide nano crystal (akaganeite) and studied their characterization . The adsorption of Pb(II) onto chitosan nanoparticles also was investigated . Peng and others developed new adsorbent with extended surface area containing cesium oxide modified with CNT that is effective adsorbent for As(V) . Moreover, another investigation showed that akaganeite nano crystal is effective absorbent for Cr(VI) . Satapanajaru and others studied adsorption of As(V) with magnetite nanoparticles and they investigated the adsorption of Pb(II), Ni(II), Hg(II) and Cd(II) onto hematite nanoparticles . Another study has been done on adsorption of Cu(II) onto magnetite nanoparticles stabilized with GA, APTES in the aqueous solution . They explained that magnetite nanoparticles are able to adsorb Cu(II) due to high specific surface and magnetic properties. Mobasherpour and cooperators studied adsorption of Pb(II), Ni(II) and Cd(II) in the aqueous solution with nano crystallite hydroxyapatite and they found that adsorption capacity depends on charge density and hydrated ion diameter . Also calcium hy-droxyapatite has used for removing of heavy metal ions from contaminated soils and wastewater . Chemical modification and functionalizing of CNT were considered by Sitko et al. . In addition, adsorption of heavy metal ions and organic pollutants onto nano materials has been done . 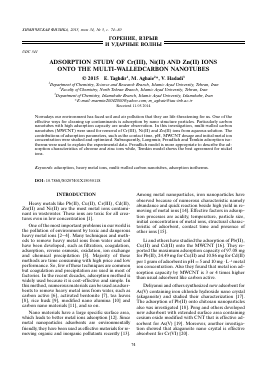 In this study MWCNT was used as adsorbent to remove Cr(III), Ni(II) and Zn(II) from aqueous solution. Moreover, the effect of contact time, pH, MWCNT dosage and initial metal ion concentration on the adsorption capacity were investigated. Finally Langmuir adsorption isotherm, Freudlich and Temkin models were applied to fit the experimental data. All chemicals were supplied by Merck analytical-grade reagents. Multi-walled carbon nanotubes (produced by catalytic vapor decomposition) were purchased from Nuetrino Co., with 10—20 nm in outer diameter, surface area of 200 m2 • g-1 and purity above 95%. A stock solution of every Cr(III), Ni(II) and Zn(II) ion with initial concentration of 500 ppm was prepared by using considered nitrate salt, (Cr(NO3)3 • • 9H2O), (Ni(NO3)2 • 6H2O) and (Zn(NO3)2 • 4H2O) with purity above 97%, in deionized water. The pH of the test solutions were adjusted using 0.01 mol • L-1 HCl or 0.01 mol • L-1 NaOH and pH was controlled with pH meter (Model 744, Metrohm Co.). The solution containing the desired amount of adsorbent was shaken in an ultrasonic bath (Model S 80H, Elmasonic Co.). For initial separation a centrifuge (Model H11N, Kokusun Co., Japan) was used. The equilibrium concentrations of metal ions were determined by atomic absorption spectrophotometer (Model AA220, Varian Co., USA). The metal ion solutions with desired initial concentrations were prepared from 500 mg • L-1 stock solutions containing nitrate salts (Merck). of them was shaken for 5, 10, 15, 20 and 25 minutes respectively at room temperature (25°C). Then, the sor-bents were separated from the solution by centrifuge and filtration through the filter paper (Sartorius Co., Germany). The initial pH of the solution was adjusted to the desired value by adding NaOH and HCl. To study the effect of adsorbent dosage, the amounts of 30, 50, 70 and 100 mg MWCNT (at optimum contact time and pH) were separately added to 10 mL of each Cr(III) and Ni(II) solution with 10 ppm initial concentration. In the case of Zn(II) solution, the initial concentration was 1 ppm. To carry out every considered experiment, 50 mg of MWCNT was mixed with 10 mL of appropriate metal ion solution with the desired initial concentration and conducted the remaining parts of experiment. where qe is the equilibrium uptake (mg • g-1) of adsorbate, C0 is the initial ion concentration (mg • L-1), Ce is the equilibrium ion concentration (mg • L-1), V is the volume of the solution (L) and m is the mass of the adsorbent (g). The time needed for the interaction between the adsorbate and adsorbent is crucial. Hence, it is important to study the effect of contact time on the removal of the target heavy metal ions with MWCNT. To determine the optimum time required for Ni(II) ions adsorption onto MWCNT, 50 mg of CNT was mixed with 10 mL of Ni(II) solution with initial concentration of 10 mg • L-1 and conducted the desired procedure at constant time and pH and then the percentage of adsorption was determined at t = 5 min (see Eq. (2)). The experiment was repeated at the same condition, but at times 10, 15, 20 and 25 min from t = 0. The resultant adsorption percentages for Ni(II) as a function of time are plot in Fig. 1. As it can be seen the best contact time for Ni(II) ion adsorption onto MWCNT is about 10 min. Repeating the procedure for Cr(III) ion and Zn(II) ion, the appropriate times were 20 and 15 min respectively. the adsorption activity of nanotube becomes fairly weak after passing certain time. BEHROOZ MAJIDI, EHSAN MOHAMMADIFAR, FARZANEH SHEMIRANI — 2015 г.
JIANG Y., LI Z.H., SHANG X.F., WANG H., WANG M. — 2009 г.
LV J.S., SONG Y.Z., XIE J.M., XU J.M., YE Y., ZHONG H. — 2012 г.
ANTING WANG, CHAO WANG, YINGLIANG WEI — 2015 г.